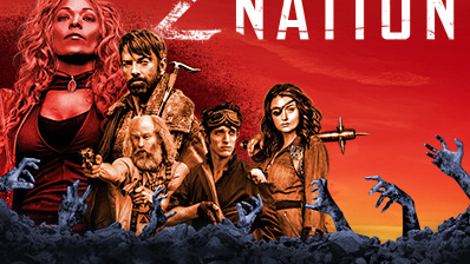 Z Nation is still in an identity crisis. Sure, it can be an entertainingly nutty show of gonzo absurdity. But as this episode proves, when it drops the goofball act and tries for something more, it can be great. It’s almost always easier to to just sit around and think, “What’s the wackiest thing we can do?” Honestly, ask anyone who’s tried to tell a story: Going over the top is easier than nuance. It’s why most grindhouse is the candy-coated nonsense we can enjoy without any critical faculties, and thoughtful, challenging narratives actually require some effort on the viewer’s part. They’re both rewarding, and for the past season or so Z Nation has been trying to have it both ways, alternating between lightweight, zany misadventures and strange, affecting drama. Unfortunately, after awhile, it doesn’t feel like the best of both worlds. It feels like a show torn between conflicting and irreconcilable impulses. 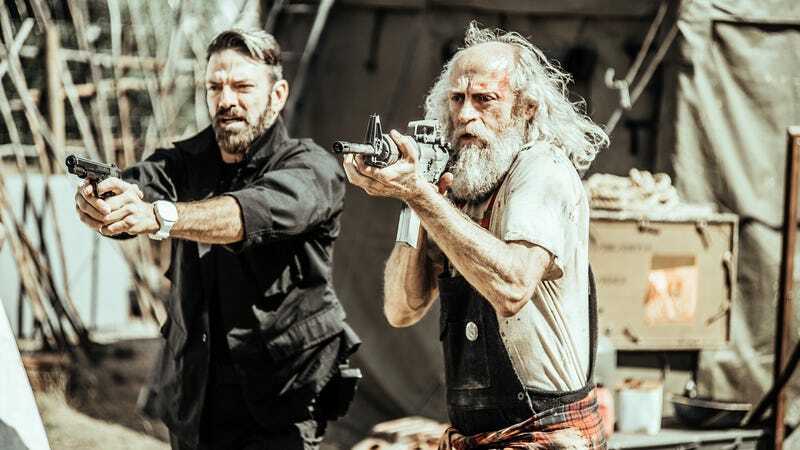 “The Vanishing” is exhibit A that Z Nation should accept its changing nature and lean into the eerie and thoughtful post-apocalyptic action-drama it obviously wants to become. This is the show as its best self, delivering a compelling plot and meaningful action, all in service of driving the overall series forward. For god’s sake, even the slow-motion was appropriately applied here. The slo-mo! If that’s not a sign of maturity, I don’t know what is. I also don’t think it’s a coincidence that this installment was directed by longtime helmer Alexander Yellen and written by series creators Craig Engler and Karl Schaeffer. These people know how good their show can be, and are trying to steer it in that direction. It wasn’t a perfect episode, but it was everything it needed to be. The mystery driving everyone’s actions here is just the right kind of menacing. An unseen force is threatening our protagonists—presumably the same unknown whatever that made all the inhabitants of the refugee camp disappear—and rather than turn it into some larger-than-life reveal, the show underplays it, letting the creeping dread slowly accumulate, right up until the moment Lt. Mueller bursts back into camp and attacks everyone. The long pauses, as everyone pointed their guns and anticipated something, only to have nothing present itself, were marvelously executed. It was an hourlong exercise in waiting. For. The. Other. Shoe. To. Drop. That refusal to pay off the larger mystery resulted in a satisfying confrontation with the other new problem, the unkillable Zs. Mueller being turned and going after our team turned out to be surprisingly emotional, mostly because Mueller was such a generous and warm-hearted guy, prone to hugs and bursts of I-feel-you understanding. Sarge’s returning to save the day didn’t just show how fiendishly difficult it’s going to be to stop this new strain of Z (nothing short of completely dismantling them seems to do the trick). It also gave Sarge an unspoken reason to be a part of the gang, as she reunites the two halves of Mueller’s picture and lays it to rest on his grave. Time will tell if she endures as a new associate or if she goes the way of Hector and others, but she’s got the wounded psyche for the job. Really, so much of the strength in this episode is in the way our heroes interact upon joining back up with everyone. And once more, Kieth Allan provides the heart of all the pathos, without a single moment of overacting or false bravado. It was touching to see the way he reacted to Lucy blowing him off, as he tried to make conversation and joke away his past failings in an effort to break through her “whatever” attitude. (She is still very much the mental child, albeit a sullen teenage one.) But it was even more affecting when he uttered an awkward “Thanks, man” in response to Doc’s hug. Murphy really just wants to belong, to have people who care for him as he cares in turn. Like last season’s unexpected high point, “Little Red And The Wolfz,” Murphy’s deep wells of pathos deliver a much-needed dramatic core to the narrative. Not that the others don’t have good moments of their own. Doc’s questioning whether it was all worth it—whether it made sense to still keep hope alive in the ongoing nightmare they’re living through—got answered by Warren with an emphatic “yes.” And his stammering admission that he just needed to hear her say it was precisely the type of subtle character beat he should get more often, rather than relying on the guy as a cheap source of humor. (Not that hearing him acknowledge most of the 20th century was a blur wasn’t a nice moment.) Warren’s haunted looks, and her decision to go east rather than toward NewMerica (that dream/vision was apparently quite convincing), provide new angles to her personality, while maintaining her soulful dominance. And 10k...he didn’t even take a swing at Murphy, which is generous indeed. Z Nation may still occasionally find itself reverting to its old ways, sacrificing depth for cheap silliness, and hoping to coast by repeating the charms of its early years, when it could get away with throwaway installments based on nothing more than a “Can you believe what you’re seeing?” brashness. But you can’t go home again, and a show in its fourth season that has proven it wants to become something incredible shouldn’t settle for any less. Welcome to the apocalypse—it’s a thrilling place now, and I wouldn’t want to be anywhere else. Seriously, even the funny stuff here was almost all smart and subtle character work. Warren’s split-second look of resigned exasperation when she hears the noise coming from the closed cabinet is perfect. Gory moment of the week: Sarge’s methodical takedown of Mueller, from the moment she blows his head apart. Still no Citizen Z or Kaya-in-the-sky-a. Who wants to lay odds on when we hear from them again?